The Yost 4 is almost identical to the Yost 1 that had appeared eight years earlier. The most noticeable difference between the Yost 1 and 4 is the fact that the 4 has two supports on the back of the machine, holding up the buttress. Also, the corners of the frame are slightly rounder. 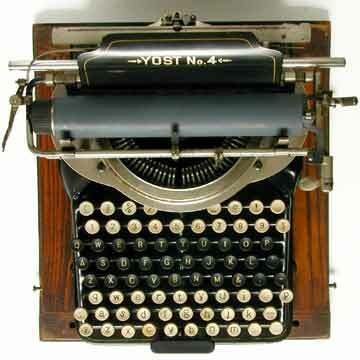 The Yost 4 was in fact the first Yost typewriter to be clearly marked with a model number. The Yost 1 was an unmarked machine, except for two coin-sized medallions on the back of the frame. Consecutive models were marked as the New Yost and New Yost 1, after which the Yost 4 appeared. 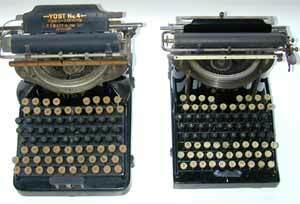 Models 5-8 were the same as the Yost 4, with different carriage widths. This picture shows the slightly bulkiers appearance of the Yost 4 on the left, compared to the Yost 1 on the right. For more information on the Yost, and for an animation of the grasshopper mechanism, check the article on the Yost 1.